This past Sunday Mr. Lemon and I drove past an estate sale. We haven’t been to one in quite some time, so we decided to stop. They are usually good for finding a few random pieces at a great deal. At this particular estate sale, the woman of the house must have been one ah-ma-zing hostess in the 50s and 60s. Her collection of pieces (and this was clearly already picked over so I can only imagine what I missed!) was so fabulous. I could have only been so lucky to have attended one of the great parties she must have thrown! We also learned that everything was an additional 50% the marked price. Say what?!?! Mr. Lemon asked if the vintage Ford Mustang was included in this fantastic deal. The two gentlemen gave him a look that clearly showed this was not the first or second time they’d heard that question and were getting annoyed by it. Said Mustang was not for sale whatsoever, let alone ON sale. If they’d asked me (which for some reason they hadn’t), I would have recommended placing a “Not For Sale” sign on that puppy to stop the endless questions. But they didn’t, so it’s their own fault if inquiring husbands want to know! A timeless sugar and creamer set for $2. We don’t even own a set currently, so I couldn’t pass this one up! 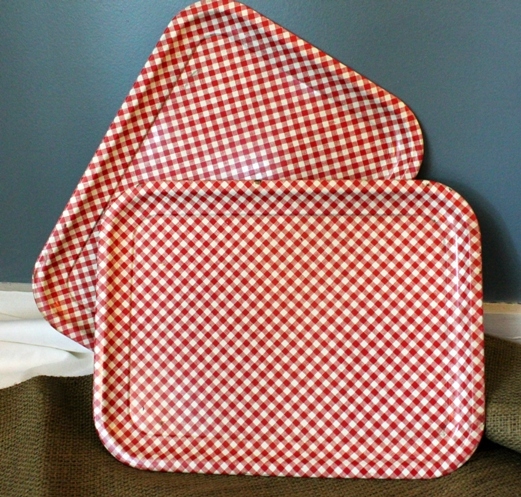 Two gingham trays for 25 cents apiece (does anyone know where to find the “cent” symbol? It’s in danger of becoming extinct!). 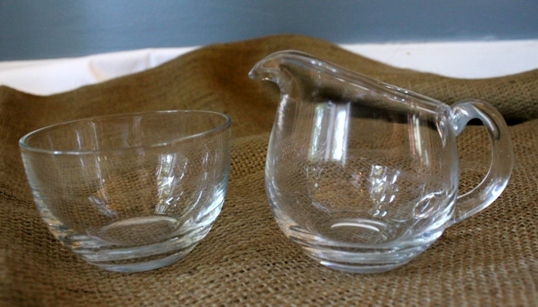 I thought these would be perfect for picnic, camping, or retro Christmas themes…or spraypaint! 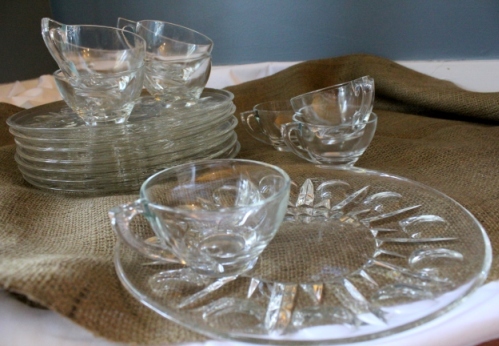 Twelve glass dessert plates for 50 cents apiece – less expensive than my plain ones from Ikea! The curved pattern didn’t photograph well, but they’re simply lovely in person. 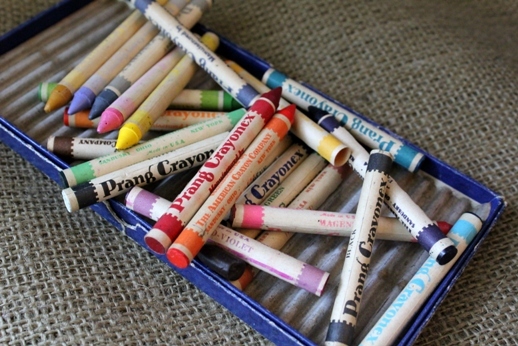 A set of vintage crayons for 50 cents. I absolutely loved the graphics of their wrappers and couldn’t pass them up! 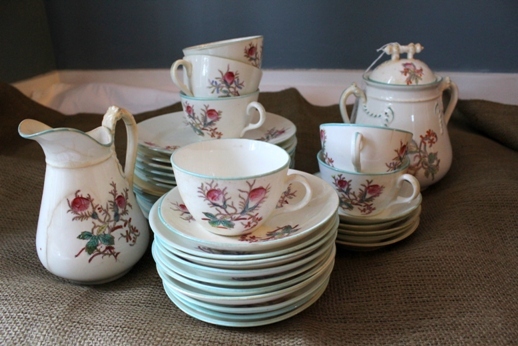 A set of china with dessert plates, cups and miscellaneous for $4.50. Some of them are pretty stained, but quite a few are still in really nice condition. I have a neighborhood ladies get together in mind for these! 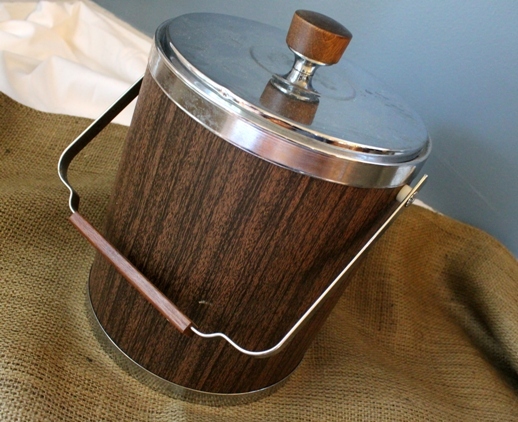 A silver and wood ice bucket for $2. This bucket makes me want to host a Mad Men party. Mr. Lemon says I’m about three years too late for that theme, but I say pshhhhh. 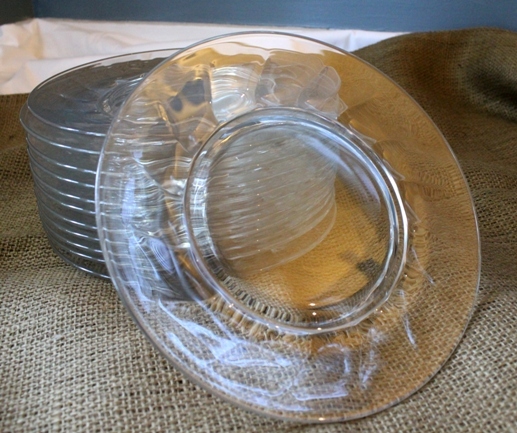 Eight sets of glass plates and punch glasses at…$2 for them all!!! I still can’t believe this deal! Even if I only use them once or twice, I will be very happy with the amount I spent on them. And they are all in phenomenal condition. Estate sales are a great place to check for good deals. Especially if you happen to be there on the last day, the sellers are usually ready to bargain. All of these items were clearly well loved and well taken care of and it makes me so happy to give them a new home and new opportunities to shine! This entry was posted in It's My life and tagged frugal finds. Bookmark the permalink. Tell Sean he’s crazy if he thinks it’s too late for a Mad Men party. No such thing as too late!